Steven Sinclair, from Dunbeath in Caithness. I've been playing Piano and Keyboard and started getting lessons from Kate Bain at the age of 8 and started getting Accordion lessons from Addie Harper Jnr at the age of 11. I enjoy playing for audiences big or small. 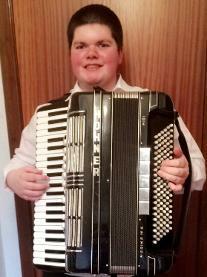 I sing and play a mixture of Scottish, Country, Pop music etc, something to try and suit all ages and tastes. I have played at Parties, Weddings, Burns Suppers, Accordion & Fiddle Clubs, Concerts, In Hotels, In Community Centres, Open Air Events and all other general functions. Yamaha Tyros 5 76 key Keyboard. I look forward to playing at a venue near you soon.